On Saturday night we were treated to dinner at the amazing house of one of our friends, Henry. Now neither my Irishman nor I had sampled Henry’s hospitality before, but we had heard phrases such as ‘Henry does the best BBQ beef in the Monaro’ often enough to know that we were in for a treat. So even though it meant driving an hour each way on a treacherous ‘roo and wombat infested road, we eagerly accepted his generous invitation with high expectations. One thing that really struck me while we were at Henry’s was how stress-free entertaining can be. When we arrived there was a fire crackling away outside preparing to become the coals that would fuel Henry’s rustic BBQ. Our valiant host was inside, casually opening bottles of wine and cracking jokes. The next hour or so was spent out on the terrace milling round the action of the BBQ. Cheese and crackers were passed. Wine glasses were replenished. Conversation flowed. As we watched Henry work magic with fire and a big piece of beef. Followed by the vegetables – giant field mushrooms, zucchini and Spring-time asparagus. When Henry gave the nod, we headed inside. Everyone played a part in getting the table set, the salad made and the glasses topped up while our host carved. It was delicious. And really great fun. Now Henry and I haven’t had any conversations about his entertaining or cooking philosophy. This golden rule is something that came ringing home to me as I observed Henry in hosting action. It’s also something I’ve learned from my own entertaining experiences. Focus on doing one thing really well and keep everything else as simple as possible. Having spent quite a bit of time in Argentina, Henry has mastered the art of cooking beef on the BBQ so this is his focus. Keeping the rest as simple as possible is super smart because it means Henry stays stress-free and it highlights the amazingness of his beef. There’s nothing else competing for your attention. 1. Shopping skills are more important than cooking. Buy a few good quality cheeses and some crackers and you have a starter ready in the time it takes to unwrap and lay them out on a platter. Likewise for dessert, make the most of your favourite bakery and commercial ice cream or load up on fresh berries and double cream. 2. Don’t be afraid to get your guests to help. Everyone loves feeling useful. Whether that’s setting the table or dressing a salad. Make the most of the potential workforce in your guests. 3. Learn to accept compliments graciously. I loved that when everyone was raving about the beef, Henry replied with an honest ‘Yes, I’m quite happy with it.’ So refreshing compared to the usual modesty – false or otherwise. 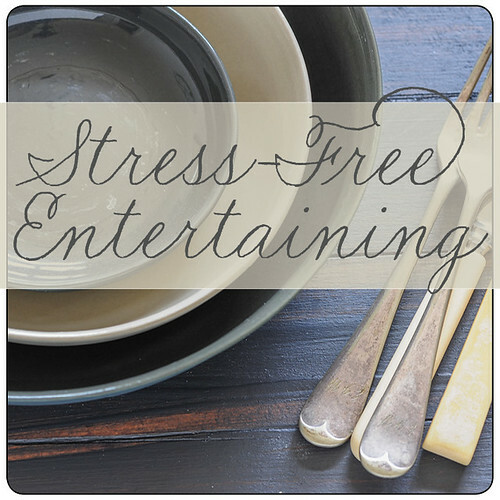 Like to discover more about entertaining stress-free? The easiest way to decide what to cook with 6 different done-for-you menu plans for relaxed dinners with friends. The secret to actually enjoying your guests and avoid being stuck in the kitchen with the step-by-step planning and timing guide for each menu. The top 5 ways to minimize mess and cleanup time. My easy quantity calculator to stop you stressing about running out of food OR eating leftovers for weeks. Ever since I first made this sauce my Irishman has been requesting it for his birthday. And every year there is loads of romesco appreciation. Every time I make it for a crowd, there’s always a lot of discussion about the sauce. There will be questions about what it’s made of and how did it get to taste so good. It’s well and truly deserving of being the ‘star of the show’ of your next dinner party. While roasting the capsicum (peppers) does take a while, it’s worth the effort for the extra flavour. But I do often take the easy way out and use roast peppers from the deli or even a jar. It’s traditionally served with pork but is equally lovely with chicken or your more meaty types of fish like tuna or swordfish. Vegetarians will love it with grilled or roast mushies. Also great as a dip. 1. Preheat an overhead grill. Cook the peppers until blackened on the first side, then rotate and continue cooking until all sides are charred. 2. Pop the peppers in a bowl. Cover and allow to steam and cool. 3. When the peppers are cool enough to handle, remove the seeds and blackened skin. 4. Transfer the pepper flesh to a food processor with the hazelnuts, garlic, vinegar and smoked paprika. Whizz for a minute or until you have a smoothish puree. 5. Add 4-6 tablespoons extra virgin olive oil and combine. Taste and season with salt and pepper and possibly a little more vinegar or paprika if needed. can’t fine sherry vinegar? – use rice vinegar or wine vinegar such as white or champagne. Lemon juice will also work. can’t find smoked paprika? – use regular paprika – it won’t be as smoky but should still be fine. short on time? – use pre-grilled peppers from the deli or even the supermarket – they tend to be smaller so you’ll need about 4.
nut-free / budget – replace hazelnuts with soft sourdough breadcrumbs. different nuts – replace hazels with almonds, brazil nuts or pecans or a combo of any of these. I don’t often cook fresh pork, but when I do I’m reminded how much I love it. Cutlets are great for entertaining because they always look impressive and are pretty much always nice and tender. 1. Heat a griddle plate, BBQ or frying pan on a very high heat. 2. Rub pork with a little oil and season. Cook pork for about 5 minutes on the first side. 3. Turn and cook for another 3-5 minutes or until the pork is cooked to your liking. If you’re not sure, take it off and chop into one to test. 4. Meanwhile, combine vinegar with 3 tablespoons extra virgin olive oil. Season. Finely slice witlof, lengthwise into large matchsticks. Toss in the dressing along with the radicchio. 5. When pork is cooked divide between 2 plates. Serve a little salad on the side and the romesco on top. vegetarian – replace pork with slices of halloumi or fried eggs. vegan – replace pork with large field or portabello mushrooms or thick slices of eggplant. The veg will take a little longer to cook. different leaves – if you’re not into bitter greens feel free to use any salad leaves. no sherry vinegar – replace with lemon juice or white wine vinegar. different meat – try pork fillet, pork belly, lamb cutlets, veal cutlets, chicken thigh fillets or breasts. pescetarian – replace pork with meaty fish such as swordfish, blue eye, tuna steaks or large green prawns (shrimp). 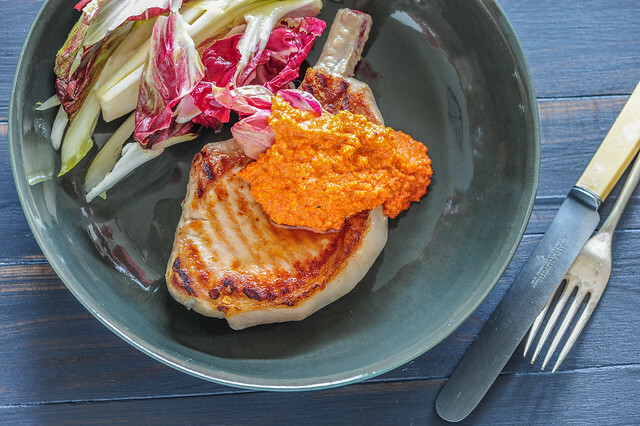 no time to make romesco? – use a good commercial aioli or make your own by mixing mayo with a finely crushed clove of garlic. Yes an operating system upgrade will trick it! Keep it simple — a great rule to remember when entertaining and also in many other aspects of life. PS I’m loving the styling with the Mud bowls! Thanks for giving me the choice of html5. Now I can enjoy the videos also. Jules, Mrs. tVM made your green pea curry last night. WOWZERS! Totally awesome, healthy and tasty! I’m looking forward to seconds tonight. Economical, healthy and delicious. Can anything be better? Aren’t you lucky tVM having someone cook for you. Jules, keeping it simple is the only way to be because if you make everything in life so complex you won’t enjoy anything. Hi Jules , I have tried to make romesco sauce several times with shocking results. Have just tried your recipe with some grilled polenta and roasted veg to go with steak. Perfect result, even my fussy irish man loved it. I did experiment and add a pinch of cayenne pepper and some orange zest and that also worked. So glad you (and your Irishman) liked it Rodney! Hey Jules, love the sound of this! Am wanting to make a whole lot of it and jar it up for friends for Christmas gifts. How long would it be good for in the fridge? Do you have any other dips or sauces that might last a little while in a jar? I usually only keep the romesco for a week or so. But if you put it in sterilized jars and sealed tight it should keep for a few weeks. If you need to keep it for longer I’d freeze it.